We all have our favorite foods — the foods you couldn’t survive a week without. We all have the foods we could care less about, too. I’ve compiled a list of the worst and best foods based simply on my personal tastes, and let’s face it, my list is foolproof. Let’s start with the most terrible foods ever. Ground beef is the most disgusting food I’ve ever eaten. Spare me the “Are you even human?” comment, because I am. How are you even human if you like ground beef? Ground beef is greasy and doesn’t go well with anything. 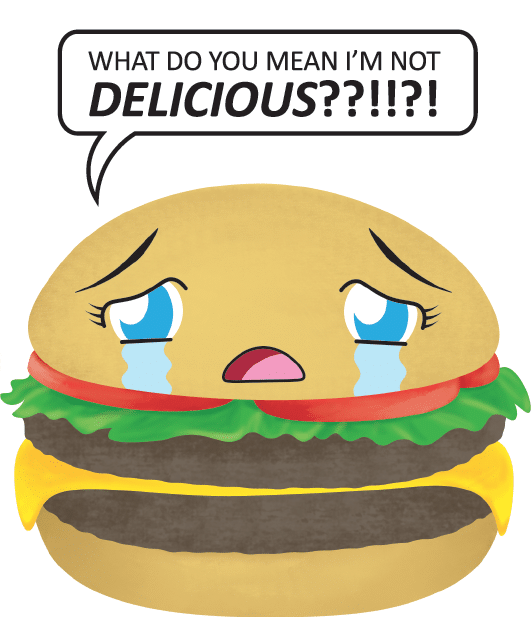 Hamburgers are the absolute worst of the worst when it comes to food. Anything with ground beef can easily be replaced with chicken or turkey for a win-win. It now not only tastes better, but it’s also healthier. Replace your ground beef and then your meal would become acceptable to eat. Don’t and you’re just doing everything wrong in life. Scrambled eggs are a big fluff of nothingness. If you add cheese, and I mean a lot of cheese, they become tolerable. The best way to eat eggs is fried. The only other way to eat an egg is if it helps make something else, besides cake, of course. Cake is also a big fluff of nothingness with a little added sugar. I don’t understand why anyone eats cake, especially white cake. It’s just not good. Icing is pure sugar and is too sweet. Putting it on top of the sweet nothingness fluff doesn’t help it at all. Why would any logical person want a cherry on top of an otherwise perfect milkshake? Cherries are the worst fruit. If you buy them and eat them willingly, I worry about you. Cherry-flavored things just taste like liquid medicine, which is why I don’t understand why anyone likes them. Again, yes, I’m human. Watermelon is the second worst fruit. I don’t understand why everyone loves watermelon so much. It’s also like eating nothing. Maybe I’ve cracked the code, everyone just really likes food that tastes like nothing. Watermelon-flavored things are also a no-go. I would never waste my time on watermelon-flavored anything. I know this is a drink, but soda is awful. I haven’t had a soda in over three years, except mixed with alcohol here and there, and I don’t miss it one bit. That’s probably because I never liked it in the first place, I just drank it because everyone else did. Coke, Sprite, Pepsi and Big Red are the worst of them. I just don’t understand why people drink carbonated flavored sugar. Now, let’s move on to the most important list — the best foods. Chicken is the best food, hands down. You can have chicken with anything and plenty of different ways. It can be healthy or unhealthy. It can be grilled, fried, ground, in a salad or in a burrito. Any way you choose to have chicken it tastes delicious. You just can’t go wrong. I’d have chicken over ground beef any day. Shrimp, though expensive, is the best seafood. It’s pretty much the heaven of foods. The best way to have shrimp is broiled with cocktail sauce. It becomes finger food that’s easy to eat and can fill you up. If I have money to eat something other than chicken, I’ll definitely be eating the single victor of seafood. Since these are both potatoes and equally amazing, it only makes sense to group them together. Tater tots are the best way to make finger food out of potatoes. They’re crispy on the outside and then soft on the inside. Add salt and you have the queen of potatoes. Hash browns are the formal version of tater tots, and you can add cheese to these. They’re the perfect company to the best breakfast food there is. Biscuits and gravy, aka my favorite food in my favorite meal of the day. Breakfast food is the best food, and biscuits and gravy are the best of the best. You just can’t go wrong with a buttery, crispy biscuit and sausage gravy to top it off. Again, I know this is drink, but it’s coffee. Coffee is perfection in a cup (except black coffee, obviously). Coffee with some sugar. Coffee with creamer. Iced, hot. Any way, any time of the day, it’s the finest of all drinks. It’s delicious coffee and it’s the savior of my life. What more can I say? Last, but not least, is another drink. Lemonade, though made from a food that didn’t make this list, is right behind coffee for best drink. It’s the perfect combination of sweet and sour if made correctly, and it makes for a great refresher on a warm day. If you add strawberries into the mix, you’re doing everything right in life. whoa whoa whoa now, i judge a restaurant by how good there burgers are. Burgers are my all time favorite food and i make everything from rice balls to pizza stuffed burgers with ground beef. I’d flip chicken and beef in my list, also add taco bell as a singular food. You’re right about the food you like. Those are all great. Pizza is the greatest food though. Preferably with chicken. That being said, where do you get off? You don’t like watermelon or hamburgers? Were you horrifically injured at a backyard barbecue? Because even that isn’t an excuse. You don’t deserve an opinion piece because you are wasting your capacity for opinions.